With more than 35 years of experience in all types of demolition projects we have earned a reputation as one of the leading companies in the demolition services industry. We are market leaders in all types of demolition, industrial dismantling, soft strip demolition, bulk excavation, reclamation and land remediation. Our highly skilled, fully trained operatives all carry CCDO cards and we invest a large amount of time and resources ensuring that they are up to date with latest codes of conduct and best practices. We also have an extensive fleet of state-of-the-art demolition plant and equipment, with multi-purpose attachments which are continuously upgraded to keep in line with industry best practice. Based in Salford Manchester and serving both private and public sector clients, we are most able to deal with demolition contracts in the Northwest UK including Greater Manchester, Lancashire, Cumbria and Merseyside. 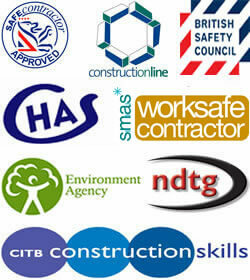 However our demolition services can also accommodate clients nationwide throughout the UK if required. We have a strong commitment to employee welfare which goes well beyond our minimum legal requirements. In a world where health and safety standards vary greatly, we provide excellence, regardless of the size, type or location of the demolition project. This means we ensure maximum possible safety for the work force, the community and the environment at large. Being serious about health and safety means being serious about training and comprehensive, on-going training is part of our everyday culture. For more information on our demolition services call 0161 736 9084 or alternatively contact us online and we will call you back.